lack of play, the resonance and intent of art dies when hidden from sight." 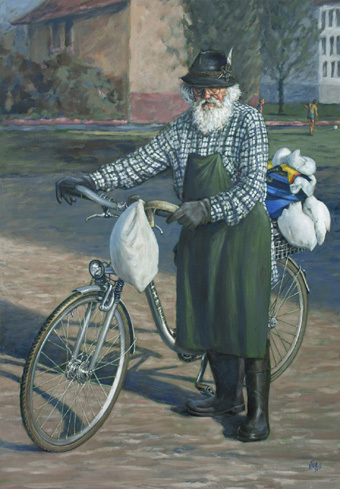 Born February 4, 1943, in the Black Forest town of Gengenbach, Otto Lohmüller is an artist who developed a unique artistic style which is recognized throughout the world, and because his work is rarely offered for sale there are few opportunities to purchase his magnificent paintings. History has also shown that those who have been fortunate enough to acquire Otolo's work have not been known to offer their treasures up for resale. To see these amazing images first hand one has had to either receive an invitation to visit the artist's atelier, or commission a painting by him. Well-known to many for his remarkable portraits of men, women and children, and his paintings of social commentary, it has long been Herr Lohmüller's desire that his work be available for the public to view on a continuous basis, for years to come. It is with this in mind that a small group of us have spent more than two years examining business models and museum formats, to determine the best means of accomplishing Herr Lohmüllers goal of sharing his work on a permanent basis. In brief, our research has provided us with what we feel is a workable model with which we can develop a museum for one of the great, natural figurative artists of our time. For more than forty years, Otto Lohmüller has articulated the individual personalities of his subjects with supreme grace and intuition. The results have been remarkable, and we now have the opportunity to house several hundred of these magnificent paintings, drawings and sculptures under one roof. This equates to over seventy percent of the artists body of work, and is a truly rare opportunity. March, 2008, saw the official recognition of the Friends of Otolo as a non-profit organization in Germany, where efforts to realize this dream in the form of Le Musée d'Otolo have begun in earnest. In this museum, we intend to house - on permanent display - several hundred of the artists paintings, drawings and sculptures, from his private collection. Yes, this is a rather ambitious undertaking, and much talent and effort will be required to see it to completion. We are currently in need of specific expertise, and if you are interested in offering assistance in translation (French, German and Russian), French law (with regard to museums), French tax law for non-profit art enterprises and dual-use facilities, or engineering expertise in the restoration of 19th century French architecture, we would welcome your assistance. On our Le Musée d'Otolo page, you will find a description of our direction and ideas for the museum. We also invite you to visit our Contributions page to learn more about how you can make a donation to Le Musée d'Otolo project, today. We thank you for your interest, and invite your participation in this great adventure. It is, after all, for you that we have undertaken this challenge, and with your help we will see it to a successful conclusion.